Arriving (metaphorically of course) to the Singapore Grand Prix, I was 27 points clear in the title race with a maximum of 40 points available. If I took 3 or more points than Jensen Button, the championship would be mine for the second year running, with three races to spare (whereas in my first season, it went down to the final race). Singapore is a very different track to the previous race at Monza. 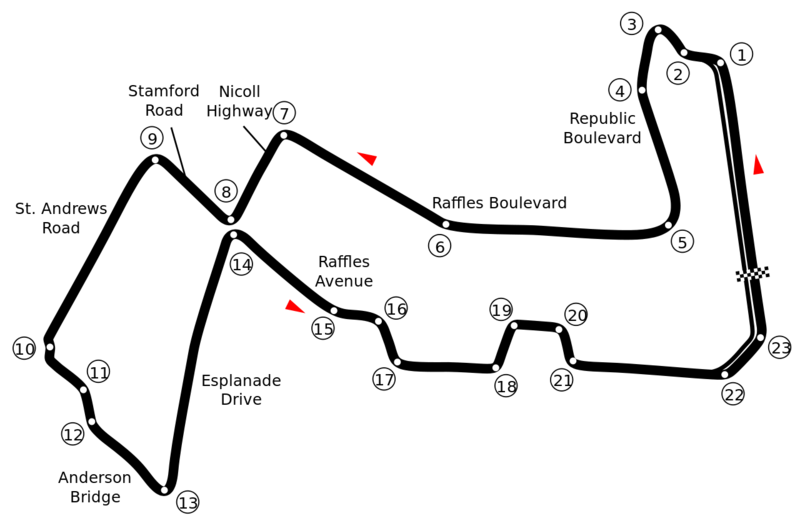 Whereas Monza is all about speed (you want the car’s aerodynamic properties set for max speed and max acceleration), Singapore is a street circuit with plenty of tight corners and chicanes, so here it’s all about grip. I wouldn’t describe any particular part of this track as being challenging – but you need to keep up the concentration here, for the race is long and one lapse of focus could see you hit a barrier. Backmarkers present a problem on certain parts of the track, where the circuit narrows and you can’t squeeze by. The worst section of track is turn 10. In real F1 this bit has been modified to smooth out the bumps, but here this little chicane is very bumpy, and attacking it at full speed can easily lead to losing control of the car. Hence, I did not hit this at speed (which also made my arrival to turns 11 and 12 easier). As ever, I secured pole position without fuss, and though I lost out briefly at the start, regained the lead quickly, seeing out another somewhat uneventful race. Behind me, the positions kept chopping and changing (the Brawns and the Red Bulls doing battle), and I hoped that Button would be bumped down to third or lower, thus giving the title to me with room to spare. Alas, it was not to be, with Button taking second, meaning we go to Japan with a 29-point gap between us. I need only finish ahead of him to secure the title – in fact, he must win, and have me take no points, to remain with a chance.